Room size: ca. 8.0 x 4.70 m with open extension to a 2.20 x 2.40 A/V bay and open kitchen. Ceiling height is 2.50 m, reinforced concrete walls of 45cm, reinforced concrete floors and roof of 30cm. Room has on one side a large glass bay. After our writer David Kan had accepted the SLAP power supply from the Canadian importer to test on his personal KingRex units, Marja & Henk in Holland were contacted directly from China for the same assignment. Double dip. To avoid redundancy, our Dutchies here focus on useful tweaks to improve sonics when the KingRex amp and battery supply are used on ultra-expensive high-efficiency hornspeakers. - Ed. After reading David Kan's very positive reviews of the KingRex line of products, we were surprised to be contacted by their Christine Wu in Taiwan. Coincidence in such matters is a bad rumor so it had to be our previous writings on switching amplifiers. Christine announced the upcoming SLAP sealed lead-acid power unit and asked if we were interested in reviewing the unit in combination with one of the T20 series integrated amplifiers. With our growing interest in new class D switching amplifiers, this would be an excellent opportunity to combine a high-quality chip amp with our 107dB sensitive horns. The magnifying capabilities of these loudspeakers would reveal any faults without mercy. It only took a few days to dispatch the KingRex T20U and SLAP to Rotterdam, no surprise as Dutch distributor Inovis acted as middle man. After unpacking, we were the proud temporary owners of a KingRex T20U with matching SLAP power supply. From David's reviews, the ins and outs of the amplifier were clear. The front sports the single volume control and blue power LED while at the back a 12 Volt DC connector is joined by a mini power switch. In the middle sit the loudspeaker terminals accepting banana plugs exclusively. Over at the right side of the back sits an RCA line input marked AUX and the USB input. Another mini toggle selects between the two. The SLAP unit enjoys the same footprint as the amplifier so they stack nicely. The front only has a tiny hole for a multi-color LED. Around back is more action. Bottom left is for the AC input complete with charger power switch and fuse. The unit accepts 90 to 260 Volt AC. Farther to the right sits the DC output fuse followed by a balanced output connector whose pins 1 and 2 are used for hot and ground. The upper right of the SLAP's back is for the PSU mains switch. Accompanying the amplifier manual was a copy of the Yuasa Battery Company's material safety sheet but no SLAP sheet. Also in the package was a simple switching power supply for the amplifier, a power umbilical to connect the SLAP to the T20U and a generic mains cable. It lasted only 30 seconds before we both ran to the attenuator to get rid of the awful sound. A squeaky, tinny, scratchy Donald Duck on helium replaced the beautiful voice we anticipated. Clearly a raw T amp. We contacted the Dutch distributor and asked if we had a burned-in sample. He answered our question with "Burn-in? 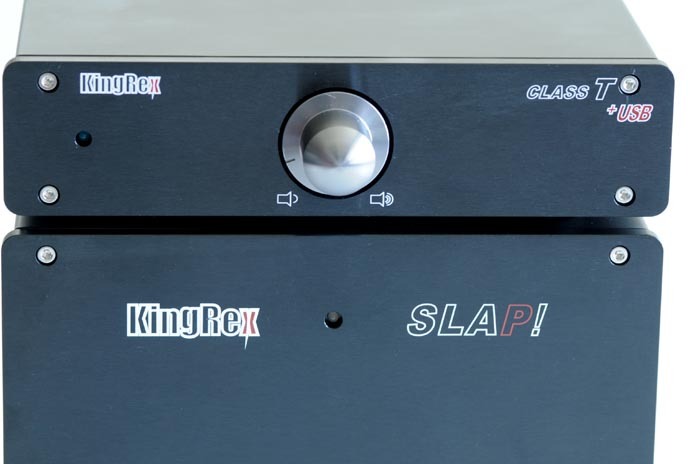 There's no need to break in a KingRex amplifier." With such a reply, there was no reason to waste further phone time and we hung up. So, we did have to play the T20U for at least 200 hours. During that time we contacted Christine of KingRex Taiwan and fellow writer David Kan with questions. David did not specially burn in his sample amplifiers but toyed a long time before starting critical listening sessions. From Christine Wu, we received the following answers. Q. Can you tell us something about the history and background of KingRex? A. KingRex Technology Co., LTD was founded in 2000. Initially, KingRex started its business by manufacturing LCD-related products like LCD monitors, advertising machines, digital frames to supply to the LCD panel trading business. As a design house and manufacturer, KingRex was also involved in different products and business fields such as PDA batteries, memory, RE modules, ODM Japanese game machines and audio products. All these experiences and technologies form the base of our continuous creative activities. With our long-term consumer electronics products in OEM and ODM, KingRex wants to explore different product lines to build our brand and market presence with strong products. After due research and product development, we entered the audio products field by the end of 2006 and we started focusing on audio products. We got great encouragement that led us to developing a whole series of compact components. Our goal and insistence is continuous creativity to manufacture the highest quality products that will satisfy all of our customers. Q. Why did KingRex add amplifiers to its product line? A. Well, I do not know the full extent but KingRex used to be the manufacturing and design house for ODM and OEM applications. We have many different departments for different product sectors. None of them however focus on KingRex. Our boss Mr. Johnson Chou encouraged different R&D chiefs to provide new product proposals to build our own brand and a long-term supply chain. So there are different products we already have tested. After performing the market analysis and target client focus, we understood that audio products would be ideal items for us. We have good designs ideas, long-term product experience and good development capabilities. We also have a good R&D team and a production line to produce a reliable product. We have more than enough resources and decided to enter the audio field to give it a go. The only problem was that in the audio sector, we were a complete nobody. But we knew that someday, we might become a somebody - if all our users loved our products. Q. 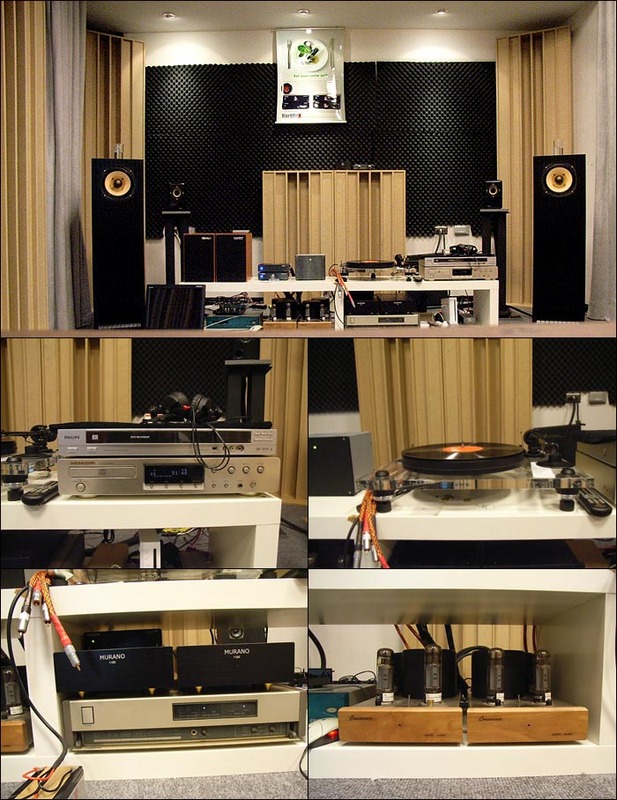 Is there an 'audiophile' at KingRex? A. Yes, we do have a resident audiophile. The R&D chief of audio products, James, has been a DIYer for a long time. Plus, I am half an audiophile as I had an audiophile dad. He loved music for more than 20 years and affected me. So every time KingRex holds a blind audition, I take part. I am glad my opinion might be considered while new products are tested or adjusted. Q. What kind of music -- and LP or CD -- is used while developing the products? A. We use many different kinds of music to fine-tune the amps - pop, jazz, Chinese instrument performances, classical. Basically no really standard CD or LP as we hope the amp will play neutral music. Q. Which peripheral equipment do you use while developing? A. Please take a look at the photos of our audition room. From a spreadsheet Christine sent, the following equipment turns up in their listening room: Philips DVDR612 DVD player, Marantz CD5400 CDP, Philips LH-1000 DAC, Project Xperience TT, Consonance M-4000S mono blocks, Murano P-200S class D amps, Lehmann Audio Black Cube phono stage, Project Box SE phono stage, Kef iQ3 bookshelf speaker, Usher S-520 bookshelf speaker, John Blue JB3, JB4 and JB8 bookshelf and floorstanding speakers, Audio Technica AD7000, Sennheiser HD6000 and HD 25 headphones and Lehmann Audio Black Cube headphone amp. All this occupies a carefully treated room.